A sheriff (Thomas Jane – The Mist, Collection) whose mission is protecting the threatened grizzly bear suddenly finds himself conflicted when a massive rogue grizzly wreaks havoc in a local Alaskan community. Enlisting the help of his estranged brother (James Marsden – X-Men: Days of Future Past, The Loft) he enters the labyrinthine Grizzly Maze to track down his missing wife, before the bear does. As the body count mounts and an infamous bear hunter (Billy Bob Thornton –The Man Who Wasn’t There and TV’s Fargo) enters the fray determined to take down the bear he’s been waiting for his whole life, no one is safe in the harsh Alaskan wilds. 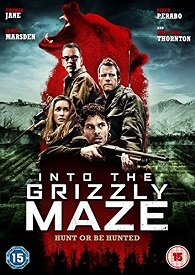 INTO THE GRIZZLY MAZE arrives on digital platforms from August 3rd and Blu-ray and DVD from August 17th, 2015, courtesy of Signature Entertainment. Who directs Into The Grizzly Maze?